Reporters are a good case study of what happens in the world of work with the advent of digitalization. Their situation today is not brilliant at all, many of them have lost their job in cost cutting programs, but there is hope. The profession will just never be again what it was. The job mutation of reporters will depend largely on how the press is managing its transition. Until now, the answers have been desperately poor but there are signs that this is going to change and that traditional press will be alive again. The problem for reporters is that they have to go through dark ages before they can see the light again since the adjustment of the industry will be slow. In the world of work and in the economic theory reporters are special specie. Good reporters are rare. The economic theory says that rare resources are expensive. But good reporters are paradoxically relatively cheap (except for a few divas). It seems to come from the fact that these professionals love nearly desperately what they do and are ready to work with a relatively large part of their wage being in ego cash. This ego cash stems from the fact that a certain degree of prestige is attached to working in renowned media. Renowned media use this to drive the salaries down. Less renowned media can’t really pay them higher salaries than the renowned media and the result is a compensation constantly driven down. The system is not unique to this profession; the movie industry for instance has a similar dynamics. Their world of work is therefore particular: they study hard, they fight to be hired at low salaries in the news press, they compete constantly against each other and against the new comers from all trades, and this is currently more true than ever, in this internet, blog and twitter era, where anyone could be an amateur reporter. And some of these amateurs are damn good, are sometimes at the right place at the right time and can bring real news value… Many news media in the Internet are thinking more and more that crowd sourcing will be the next big innovation on the cost side of the business model. But most of these new reporters are only paid in ego cash while professional reporters still have to find a way to pay their rent. The phenomenon again is not unique, the same happens in the music industry, in the photography industry, in the editing industry, etc. in all those fields where digitalization has allowed the arrival of new players because of new technologies enticing new comers to believe they can be as good as the professionals. Reporters are also a special breed because the business model sustaining their life is traditionally a strange one where cross subsidization is the rule. Few of us would really pay for buying news for what it costs to sustain a large crowd of professional reporters. But everybody pays for a general source of information and for the classified (both for posting and for reading) and agrees happily with the fact that part of the cost is actually paid by advertising. Advertisers buy space because the media are, well, what they are: a media to reach consumers. 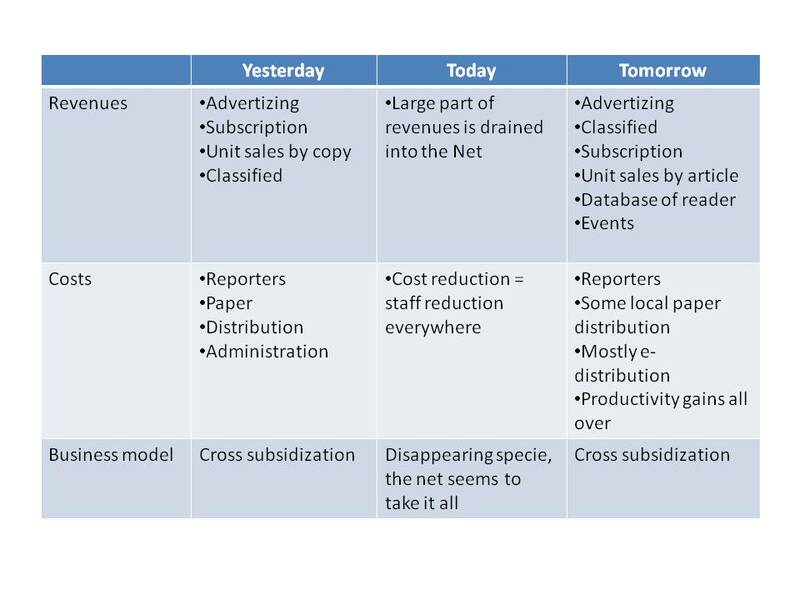 The industry is in crisis because this whole business model goes down the drain: paper readership and sales by the unit or by subscription are decreasing in the news world because less people want to buy a paper (even if «bit readership» is increasing and even if paper sales are increasing in the tabloid world), paper cost, printing and distribution costs are increasing, advertising revenues are diminishing because of the crisis and because they are spread in many more media than before, including the internet websites. The traditional media see their slice of the pie shrinking. In addition, the revenue attached to classified is fading because these needs are better served by a multitude of Internet sites both for goods and jobs. In short, reporters are squeezed between decreasing revenues and increasing costs. Staff reduction is the first rule. Staff externalization, i.e. by using free lances is the second rule. Crowd (free of charge) sourcing is the emerging third rule. Reporters seem doomed and their specie could disappear. The risks for our societies to see this specie disappear are not negligible, namely because investigation journalism, local bureau reports, professional synthesis and analysis, etc. are part of what the texture of democracy is made of. If reporters disappear, will the amateurs of this world, whichever their quality, be able to replace their professionalism and dedication? Who will write about the next Watergate? Who will play the role of citizen’s lobbyist trying to influence legislations for the interest of the citizens instead of the interest of too specific interest groups? It might be the new crowd but it might also not. Hope comes from the threat itself. What happens in the Internet is the advent of data mining. The old recipe of Google is to analyze individual’s interest via one’s search activities, mail activities, browsing activities, etc. and to target advertising accordingly. Advertisers have got the message so well that today they are less interested by the context in which an individual can be reached (the TV program to which to attach an ad because they have assumptions about the audience, the magazine or the paper because they have assumptions on the readership, etc.) than by the individual’s profile whichever channel he is currently using. And this is precisely what is changing and what could change for newspapers, provided they understand that the switch to the net is inevitable (and they do, they just don’t know yet how to go there). Il will drive their costs down and could allow them to invest again in the quality of their content and their staff. What will happen in the next few years is interesting and leads to optimism. First, the traffic on the Internet will switch more to social networks, and will surpass the one on the search engines. 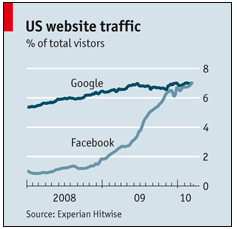 Facebook is already attracting more traffic than Google in the US. This will be the case in all markets because it is a social phenomenon with an exponential growth. Second, the online reading capabilities will become much easier and much more like paper reading, with the arrival of the iPad and its soon to come competitors. It will mean that downloading papers, articles, free of charge or with a subscription or a unit buying way, will be a real simple experience and a cheap investment like to buy (or to get free) apps or music for the iPhone. This will give the opportunity to newspaper for creativity and appeal. Third, the flood of information we receive on an hourly basis is just not convenient. We need to win time, to get aggregators, filters, synthesis, opinions to rely on, etc. And this is precisely what reporters and journals are good at. This is what their whole profession is about. There might be some competitors from the web that will arrive with these capabilities and that will aggregate blogs, produce synthesis and superior analysis. They will even be good enough to produce «journals for one» where one will get on his iPad a journal with only the articles he is interested in, and this will be done in probably quite a professional way. But two things will be very hard for them to build: a) a trusted brand image on deep quality, professionalism and b) a high level «opinion trust» i.e. a subjectivity that the reader expects to read. Indeed, no paper is neutral, every brand of news media on the planet has a twist toward a political side or an opinion of any sort, and this is precisely why we buy this or that newspaper: not because they are neutral but because they are close to us and our opinions in a way as fair as possible (in our subjective definition of fairness). We like to feel in our papers the identity of our intellectual tribe. Newbies cannot achieve easily that trust and that complexity of representing opinions as established newspapers brands can. Because these brands bring something else that is very hard to create for others, even with the most advanced technology: oriented serendipity. To many of us, a newspaper is like a person. We trust the analysis, the editorial lines, not only for general information, political information but also for serendipity information. We don’t expect the Financial Times or the Guardian or Libération or Le Monde to deliver to us People gossips or art critics on things we are not interested in (we may buy other papers for that). We expect that the selection done on the art page, the movie page, the literature column, the sport section, even the gardening section, etc. fits with our own personality. Again it is a question of trust in the «Newspaper persona». Fourth, if newspapers play well, and this is where the big “if” is residing, these new activities and diffusion will give them one of the most valuable database on the market, allowing them to propose to advertisers an incredibly well targeted advertising to one. How could this happen? The path is already shown and is a combination of ways to obtain information on the identities of the readers. A practical way, that is already partially observable, will consist of proposing free access for a number of elements like the titles and a few articles, then proposing a free subscription to the same few elements but sent via for instance the iPad or the iBook rather than searched by the consumer and given against personal data; then proposing a pay per article or pay per issue, similar in principle to the kiosk selling papers in the past except that every buyer leaves his visiting card behind; then proposing regular full content subscription (with the classic marketing incentives) and many additional free services (community discussion forum, events like special exclusive webinars with personalities, free classified, reduction coupons, personalized additional newsletters, etc. There is a lot of room for imagination here). They will also, like in the music industry, use their brand name to organize events, on line or off line (and not only for subscribers) and build them as revenue sources. This complex combination of value added services and of «give me your data» format will lead to a series of revenue streams and to a very precise and advanced database where the personality of an individual will show more distinct facets than the ones shown on social networks. Many systems will obviously help to combine the various data available on the Internet on an individual in order to create the ultimate targeting for advertisers (by the way, this article does not review the moral or social implications and just focus on the business realities). Newspapers, or better news-e-paper will have an unprecedented knowledge of their readership, which is the current most important currency in this Internet age. What this says is that newspapers, and therefore reporters, were living in a world where the business model was cross subsidization, are living in a world where the whole business model is dis-intermediated and de-aggregated, could live in a world where a completely new cross subsidization will appear and where they have already a competitive advantage. However, they need to act fast in order to secure and build on their current «market share of trust» based on quality filtering and quality writing… the skills only reporters possess. Newspapers should be able to pay their reporters again; and they will have to because they are the essence behind the brand. But what is the lesson of this story for reporters themselves? Should they just wait for the upturn? For them, as for many other professions being drastically changed by digitalization, there is room to act on their fate. In their case, they must clearly become as fast as possible fluent in the language and implications of this new digital world, for their investigations, for the quality of interactions with the readers (the old days of the «letters from our readers» are definitely over), for their participation to the new sources of revenues as moderators of debates, organizers of events, and finally for the very way they deliver information: they have to become, also, bloggers.